Grand Chancellor Hotels is a hotel group that operates throughout Australia and New Zealand in key destinations. It consists of ten four and four and a half star properties. In January 2017, after extensive research into new technologies and tools to optimize the guest experience on their website, Grand Chancellor joined forces with Triptease. 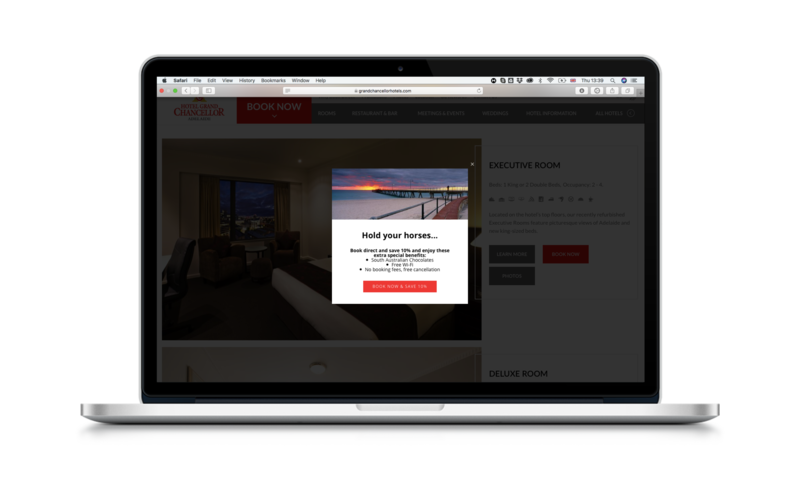 “In Australasia, the choice of websites for the guest is vast and confusing, with many options coming via affiliate sites that have no direct connection with the properties,” says Hazel Rigler, Director of Marketing and eCommerce at Grand Chancellor Hotels. The OTAs and wholesalers remain important partners, and the hotel teams work very closely with them to ensure contractual obligations are met and rate parity maintained. This is easier said than done however, with many complications in the market including on-selling to affiliate sites, undercutting of margins, click baiting, static rates and allotment being sold; ensuring the revenue team are kept busy managing all of the problems. That’s why Grand Chancellor’s team decided to take control into their own hands. To provide potential guests with a better experience of content and information about the properties than they would get on the OTAs, the team at Grand Chancellor also wanted to personalize the process of searching and booking on their website. They knew that the digital experience is a crucial part of the guest’s lifecycle. With Triptease’s Direct Booking Platform, the hotel team aimed to develop targeted campaigns and customizable website experiences to drive direct bookings. Today, eight of the Grand Chancellor properties use Message Porter to provide the best personalized experience to website guests. They also display Triptease’s industry-leading Price Check on the booking engine to inspire trust and confidence that the best price is available direct. To reduce their undercut rates, the hotel team keeps watch on disparities daily. “One of the main focuses of our revenue team has been cracking down on disparities. Our revenue managers use the Disparity Dungeon regularly to ensure parity is adhered to.” shared Hazel. Three of the chain’s hotels are also using AutoAgent. Today, Triptease’s fast-learning chatbot has already produced accurate responses at a 70% success rate, capturing online guests’ contact details when unable to answer. The data captured by the Platform demonstrated that 3⁄4 of Hotel Grand Chancellor’s online guests visit their website using desktops. This insight along with the analysis of campaigns performance has allowed the hotel team to continuously improve their messages. The hotel chain has already run nearly thirty Message Porter campaigns, seeing a significant 5.6% click- through rate on average. Real-time campaign performance data allows the team at Grand Chancellor to continuously iterate and improve their messages with tweaks to design and copy. Grand Chancellor Hotels team benefit from the full-time support of Triptease’s Singapore-based Direct Booking Coaches. “Our relationship with our Coach has been collaborative from the very first meeting,” Hazel says. The Triptease team collects their feedback and continuously improves the Platform’s features to meet Grand Chancellor’s needs. For the Price Check and Disparity Dungeon, the parity management is going extremely well for this hotel chain: only 3.2% disparity rate when being undercut by OTAs. This number sits significantly below the lower quartile (6.6%) across all Australian hotels. Grand Chancellor Hotels has reported seeing significantly higher conversion rates on their booking engine. Today, it is at 11.7% - significantly higher than other Australian hotels (6%). Grand Chancellor Hotels aims to stay above their region’s average website conversion rates. After successfully using AutoAgent with three hotels, the group is considering adopting the same feature on some of their other properties. They will continue to work closely with the Triptease’s team to make the most out of Message Porter’s newest features, and work together towards reducing their already regionally low undercut rate with Price Check and the Disparity Dungeon.